We don’t have a church furniture store that church members can visit to choose church furniture and we’re often asked why we don’t. It’s because a church furniture store is not the best option for picking out church pews and other church furniture. We’re located in Twin Oaks, Oklahoma and although that’s only 440 miles from the center of the contiguous United States, it’s not handy for all the congregations we serve. Let’s pretend for a moment that we did have a store and it was an easy place to get to for everyone who wanted a church pew. When you’re looking at church furniture, you want to imagine it in your church, with your lighting conditions, flooring, paint colors, and everything else that goes into how your church will look in the end. Have you ever bought furniture in the store and gotten it home only to find out that it wasn’t what you thought? It happens more often than you’d think. What looks great in a furniture store doesn’t always look great in an individual church. A better way to choose church furniture is to choose it in your church, while you’re sitting where the church pews will be installed. Taking in the features of your church and putting those into your plan for church pews is a much better way of choosing furniture than in a church furniture store. If we did have a church furniture store, it wouldn’t be the most convenient to access for everyone since we can’t be everywhere at once and keep costs low. A part of the church budget for furniture would inevitably go to travel costs to get to the church furniture store—that’s less money to spend on the church furniture and isn’t the best way to deal with a tight budget. 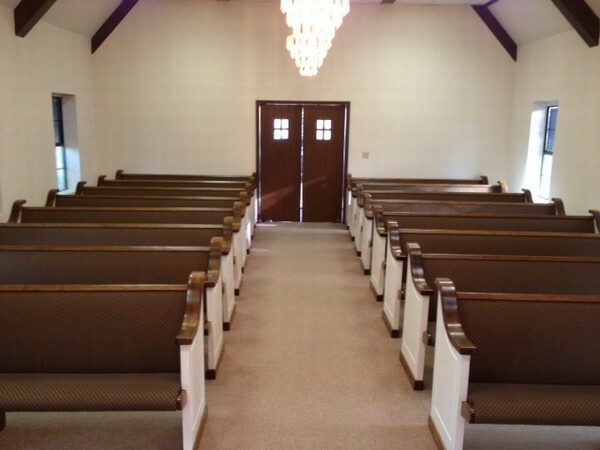 Since our mission is to provide the highest quality church pews at the most affordable costs, having a church furniture store wouldn’t be a smart way for us to help churches best use their church furniture funds. Instead of seeking out options in church furniture stores, download our brochure. Check out our stains and fabrics online, and visit our gallery to see how beautiful our pews look in use. We will also be happy to provide references.